What makes this journey unique? Meeting Mother India in a unique, non-touristy way, with a special group guided by meditators and cultural experts. Exploring the Himalayas, the unique Indian culture and spending time on the banks of the River Ganges. This is not just a tour, it’s a doorway to the world of Indian mysticism on a safe, expansive, life changing journey. Trekking through the breathtaking Himalayan untouched nature and valleys of Ladakh. Camping in amazing locations under the vast sky, seeing the local village lifestyle with great guides, camping crew and equipment. Start the day with meditation – from contemporary master Osho to connecting with ancient Kashmir Shivaism. Bringing meditation to our everyday lives, connecting deeper to our hearts and our environment. A true journey of awakening. Feel touched connecting with the kids from the Nomadic school in Ladakh, where these children stay 10 months a year. 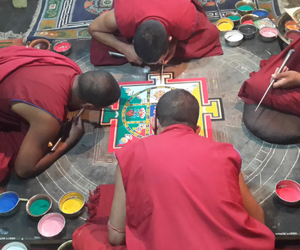 The school is sponsored by our friends in Ladakh, we’ll create an activity to share, followed by desert camping. With our feet on the ground, enjoying life as Zorba the Greek – and our hands reaching for the stars and higher consciousness, we reach the Buddha in each of us. This spiritual journey includes the comfort, great food and the beautiful places. Discover the hidden gems of India, such as its amazing artisans – world famous for their pashmina craft, meet unique local characters, get a taste of real life in these remote places, and experience what few travellers get to know. We’ll travel supporting local communities, respecting cultures and the environment. You may also collaborate with local projects. We partner with local businesses, fellows, and eco-travel sustainable organisations. A dream journey through the rich variety of lifestyles and traditions in India. From the famous bazars to the mysteries of Kashmir to experiencing natural life in rural villages. Filling yourself with the freshness and inspiration of the mountains, the streams, and discover your ancient heart with the devotees on the River Ganges. Arrival and welcome. 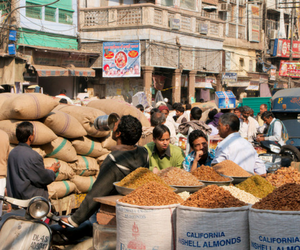 Old city tour, visit the lively spice market and try delicious food. Next morning, we fly to our next destination. Stay on a gorgeous Houseboat on Dal Lake. 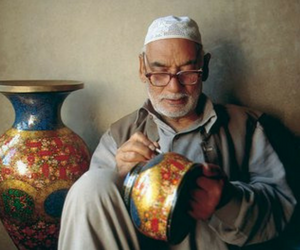 A day to connect with the heart of Kashmiri artisans and their unique craft-work. Take in a unique Kashmir Tantra Shiva ashram. Royal Palaces, Buddhist monasteries near Leh, evening visits to enjoy some of the most beautiful panoramic views, like Shanti Stupa. Trekking through villages, monasteries, apricot and apple trees and camp under the stars. Walking through passes. Back in Leh, private ceremony with a Ladakhi Oracle. Visit a remote nomadic school, to meet the nomadic children in a social project. Drive to Manali into the land of the Hindu temples from the epic Mahabharata. 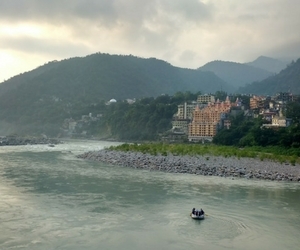 The sacred River Ganges, home of Himalayan yogis, the heartland of Indian ‘seers’. The place the Beatles were inspired in the 60’s. 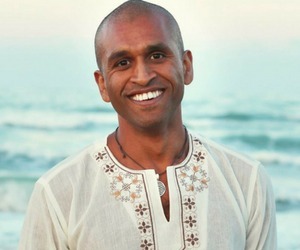 You’ll enjoy group private practices of meditation, facilitated by Omkar and other authentic spiritual guides along the way. We’ll have fun experiencing different ways to go within, and maybe you find one that really clicks for you! When you open the doors of your awareness in a space like this, wonders can happen. Food is a big deal in India and yes, we love food! You’ll taste yummy Indian food from the north, to Kashmiri, Ladakhi, Tibetan to Ayurvedic sattvic food. We’ll take you to our favourite spots – whether it’s the hidden lassi spot, the amazing momos or the best chai you can find. Helping to make the journey more relaxing, lively, colourful and enlightening. Meditators, mystics, mountaineers and bikers – meet the conscious travellers guiding your journey. Not to mention the other spiritual guides we’ll meet. He’s a meditator, transformation guide and lifelong traveller. Omkar loves to share his love of life and exploration of the inner and outer, especially in going deeper into ancient cultures. 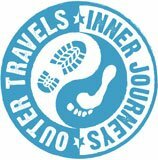 One of the partners of OTIJ, he loves to share unique journeys for transformation and conscious living. Few know Ladakh and Kashmir as him! 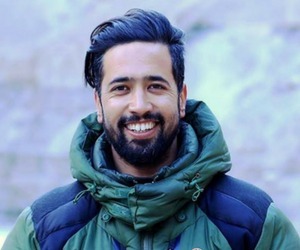 Born in Leh, a passionate ethnographer and mountaineer who has dedicated his life to exploring and documenting through photography the life, the culture and nature of the Western Himalayas. He is passionate about art and helping the local communities. 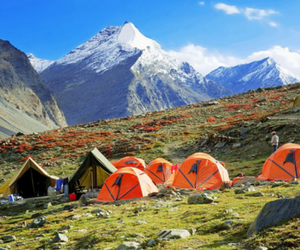 Are you ready to pack for the Himalayas?